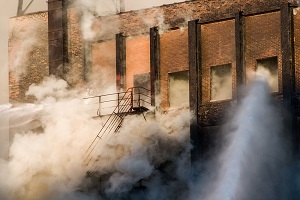 Commercial Fire Insurance May Not Pay for Smoke Damage | The Voss Law Firm, P.C. Will Your Commercial Fire Damage Claim Cover Smoke, Soot, and Ash Damage? A fire at your business can have catastrophic effects even when the fire is contained and doesn’t cause any injuries. Your business owner’s policy should include fire insurance coverage, but insurers are often ready to dispute coverage and amounts in the fine print, including payment for damage not caused by the flames. Attorney Bill Voss explores common problems owners experience when claiming losses due to smoke and soot damage after a fire. Many people breathe a sigh of relief when a structure is still standing after a disaster. However, when a fire strikes a commercial property, the event is just the beginning of the owner’s problems. In many cases, insurers are more likely to cover a building that is completely unsalvageable than one the has suffered a partial loss due to a fire, leaving owners on the hook for any losses due to smoke, ash, or other byproducts of the fire. Filing a claim as quickly as possible. All insurance companies require policyholders to contact them within a certain amount of time after a loss. The longer you wait to notify an insurer, the more likely it is that you will have trouble collecting payment. Keeping any smoke-damaged items. Soot and ash on your possessions isn’t just smelly and unsightly, it be hazardous to your health. Chairs, couches, wall hangings, and other soft items can retain carcinogens from the fire and harm visitors to your property. Although these should ultimately be discarded, it is a good idea to retain at least one of each item you are claiming (in an offsite location away from customers) so the insurer can see the extent of damage in person—especially if the items appear intact in pictures. Documenting the claim in detail. The records you keep when making a fire damage claim can literally make or cost you money. You should thoroughly document your losses and damages with a pictures and a list of information, including the date the loss occurred, all locations affected by the damage, your point-of-contact person, descriptions of lost or damaged contents, a list of temporary repairs, and a report from the police and fire departments. Staying in contact with the insurer. You will likely exchange several emails, text messages, and paper documents back and forth with your insurance company before your claim is settled. Make sure all correspondence is organized and kept in a single location with your claim number written at the top. Negotiating cleaning vs. replacement. Since an insurer will want to pay as little as possible for your damages, the company may be unwilling to replace items that don’t “look” damaged. However, most policies allow payment for restoration and cleanup after a fire, including reupholstering furniture and professional dehumidifying, deodorizing, and air purification services. If your property contains health hazards after a fire, the insurance company is more likely to pay for professional cleaning services rather than risk any legal liability. Knowing the limits of your policy. In some cases, a business will suffer smoke and water damage because of a fire on an adjacent property. You should carefully examine your policy to see if you are covered and how much you may collect in damages for a fire on someone else’s premises, especially if the two properties are attached. While some policies clearly outline the amount they will pay for smoke damage, many are unwilling to place an exact number on the loss. If your business experienced extensive smoke damage and your insurer is denying fair payment, we can help. Simply fill out the form on this page today to contact the Voss Law Firm or order a free copy of our book, Commercial Property Owners Must Read This BEFORE Filing an Insurance Claim.